Belgian Malinois Breeder serving Windsor Ontario, Essex County, Kent County, the Greater Detroit Area, Maricopa County and the greater Pheonix area. 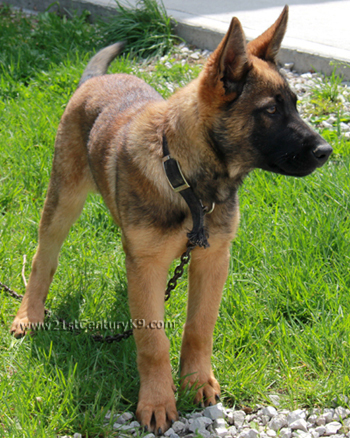 21st Century K9 Belgian Malinois are strong, highly intelligent and harding working dogs with cat-like agility. They are loyal and self confident, with a reliable, stable temperment. Our Belgian Malinois are friendly, watchful and alert. They are quick to understand a new task and they excel at obedience training. 21st Century K9 Belgian Malinois make superior Personal Protection Dogs, Search & Rescue dogs, Civil Security and Law Enforcement K9s. Our Belgian Malinois are tan with a black mask or pure black. A six week basic obedience course is given free of charge to the new owner of every Belgian Malinois pup. 21st Century K9 offers Level 1 six week Basic Obedience Classes, Level 2 Advanced Classes , Level 3 - Mantracking/Scent Work Classes, Private Training on and off site, Gun Dog Training - Hunter Retriever and Personal Protection Training.